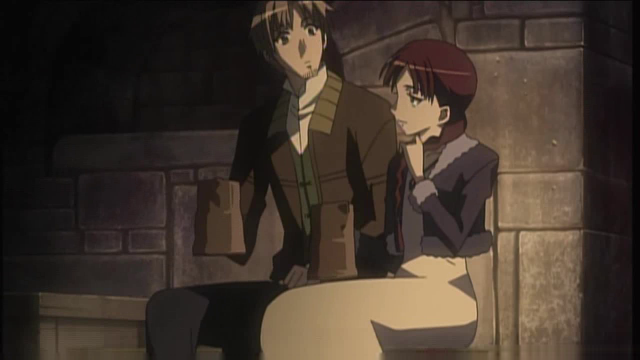 Interested by some promotional art and by a resemblance of the main female character to my brother’s own Yumiko, I took a look at the first episode of Ookami to Koshinryo, better known as Spice and Wolf. I’m being told it is inspired by a series of novels and that there is also a manga version. The story is set in what it seems to be a Middle Age Europe, where there is an official religion co-existing with other ancient rites. As a matter of fact, the anime opens with one of such rites, to be precise with a pact made by a village with a local deity in order to get a good harvest. Then the opening kicks in and we get a look at the various characters. In particular, we get to know the male main character, Lawrence. 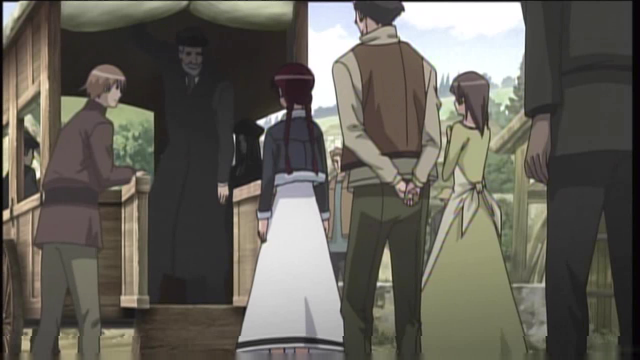 Lawrence is a merchant and travels around the land selling wares, and he stops by the villlage shown in the first scenes, where he watches the harvest ceremony in favor of Horo (the deity) and also sees a “colleague” of his (the girl shown in the picture above, an original character for the anime). Also, his carriage bumps into something, but he does not find the reason. He finds out at night, when he leaves for the next village. Inside his carriage he finds a naked woman with a wolf tail and wolf-like ears. The woman introduces herself as Horo, the actual deity of the place. Apparently she’s tired of being there helping the harvest as the people there almost forgot about her and just repeat the rituals without knowing why. She asks Lawrence to bring her with him, and he, unimpressed, asks for proof. Horo eats some wheat and something happens, but we can’t see as the scene changes almost immediately. Lawrence has returned to the village and has a talk with his “colleague” which apparently wants to join forces with him in the merchant business (and by the way she acts, we see that apparently it’s not just a business interest). However, he acts quite detached and she doesn’t like it that much. They also talk about Horo, but she believes it to be just a myth and nothing more. Before sleeping, Lawrence gets again a visit from Horo, and we finally get to see what happened before: Horo’s arm became indeed something not so natural, indeed proof of her nature. 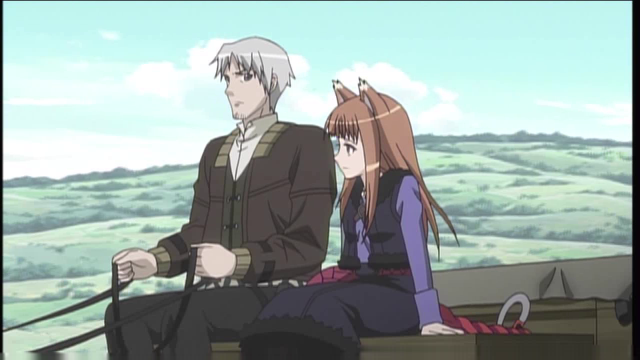 The following morning, she gets on some clothes on Lawrence’s carriage and the two leave the village, with Horo intent on becoming Lawrence’s business partner. My first comments on this anime are that it is a “wait and see”: the approach is somewhat different in some areas (Lawrence that reacts differently than most anime characters, though his reaction is unrealistic as well) and I’m curious to see how the story will develop in the future, because the first episode is kind of self-contained, and doesn’t give any hints to future development. However, the predicted episode count is only 12, so there may be the chance of a screw up along the way. Animation-wise, this episode is average, with nothing extremely good and nothing extremely bad. The same can be said for the soundtrack, somewhat anyonymous at times (I admit I barely noticed the tunes). I don’t know if I should recommend this anime or not, I guess it mostly depends on the watcher, and to individual tastes. As for myself, I’ll see how it develops.